We want you to enjoy boating and water activities in Puget Sound and Kitsap waterways all year round ~ spring, summer, winter and fall. Boating provides spectacular views of the Pacific Northwest, it is a great way to relax with family and friends, and it is fun! Being prepared is part and parcel of fun and safe boating. Nothing is quite as tragic as water related accidents, most often, because the tragedies could have been prevented. Too often water accidents occur when otherwise informed and responsible people make the serious mistake of thinking they are strong and skilled enough to keep themselves, passengers and others safe. On average more than 700 people die in boating accidents annually in the U.S. And drowning is the second leading cause of accidental death for people ages 5 to 24 years. Remember, if it’s predictable, it’s preventable. Take a boating safety course and earn your boating safety education card. Among other things, the course covers what to do in event of a water emergency such as the best way to get help by using a VHF-FM radio as the primary means of making distress call. Using a marine VHF radio notifies the US Coast Guard and alerts boaters in the area of your water emergency situation so that the nearest boat can provide assistance. Cell phone calls to 911 should be used only as a secondary option. 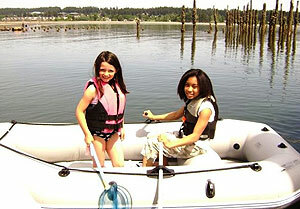 Wear a lifejacket when on a dock, boating, skiing or tubing. Lifejackets Float, You Don’t. Lifejackets add buoyancy and provide added insulation to help protect against hypothermia. Limit the number of people in your boat to avoid overloading and the risk of capsizing. Know the water and weather conditions. “Reach, Throw, Row, Go” ~ Remember this saying if someone falls into or is thrown into the water. Reach for the person with your arm; Throw them a lifejacket or ring buoy with a line attached; Row your boat out to them; and, as a last resort, go in the water after them. Going into the water yourself is the most dangerous as the other person may cause you to drown. Have fun on the water this year by being smart. Help us eliminate drowning in Kitsap County waters by modeling water safe behavior and by raising the awareness that drowning is preventable.